Art Deco cinema comprising 2-storey, 5-bay, faience-clad, entrance front with deeply recessed doorway under projecting canopy and Art Deco tetrastyle Doric portico in antis at 1st floor; large, gabled brick auditorium to rear. Designed by the renowned cinema architect W E Trent and opened in 1930, as the New Victoria Cinema, this building is an outstanding example of an Art Deco cinema in Scotland and the United Kingdom. It is Scotland's best surviving example of a cinema from this period which includes a largely extant original interior decoration scheme. During the 1980s the original auditorium was divided up into several smaller auditoria, and a number of other alterations have been carried out (particularly in the entrance foyer). However, this work has been done in a largely reversible manner and most of the original decorative scheme has been retained, although some parts are currently concealed behind false ceilings and other additions. The New Victoria Cinema was initially planned under the auspices of the Provincial Cinematograph Theatres (PCT), although by the time it opened the company had been taken over by the giant Gaumont British company. PCT had been founded in 1909 with the aim of providing a diverse chain of cinemas around Britain and were an unusually early example of a chain with national aspirations. PCT cinemas had luxuriously appointed interiors, central locations and ran continuous performances. In 1925 William Edward Trent was appointed as their chief architect, a position he retained under Gaumont. Although W E Trent had designed very few cinemas prior to his appointment by PCT, he subsequently became one of the leading cinema designers in Britain, his works including a number of architecturally distinctive and lavishly appointed Gaumont Palace cinemas in England. Cinemas tended to be built by local architects and therefore examples in Scotland by leading English architects are very rare. The New Victoria cinema is the best (and only large-scale) example of a custom-built PCT/Gaumont cinema in Scotland and the best and most intact example of an acclaimed English architect's work in Scotland. The interior and exterior treatment of the cinema is unusual, marking a transitional period in the work of W E Trent, the development of the PCT/Gaumont chain and the development of cinema design more generally. The external treatment is demonstrative of the emergence of Art Deco from the Neoclassical styling that had been popular in the 1920s. This is also evident internally, especially in the auditorium, which was designed to give the impression of an open-air Greek or Pompeian (contemporary accounts disagree) amphitheatre with a temple-style pediment framing the stage. This style is best described as semi-atmospheric. Atmospheric cinemas were designed to give the audience the impression that they were sitting outside and were pioneered in America in the 1920s. The first examples in the UK were built from 1928, but they were not very common. The semi-atmospheric intention here, combined with Neoclassical and Art Deco detailing is highly unusual and was not repeated in any of the other PCT/Gaumont cinemas by Trent. The majority of other atmospheric cinemas built in Scotland have either lost their interiors or been completely demolished. Only one truly atmospheric cinema now survives in Scotland: the Picture House in Campbeltown (see separate listing) which has also been somewhat altered and was built on a much smaller scale than the New Victoria. No semi-atmospheric cinemas of comparable scale and style to the New Victoria survive in Britain. 3 February 2003: The Herald reports that the cinema is threatened with closure, following competition from new multiplexes. The local councillor is campaigning for it to remain open. 13 March 2003: The Edinburgh Evening News reports that the cinema has been sold to developers Duddingston House Properties for over £2m. 10 April 2003: The Edinburgh Evening News reports that the cinema has won a stay of execution for a further 6-12 months. Actors Sir Sean Connery, Brian Cox, James Cosmo and Dougray Scott have all campaigned to keep the cinema open, backed by the Southside Association of local residents. The cinema will be leased back to Odeon Cinemas until its future is finally decided. 11 April 2004: BBC News reports that Duddingston House Properties is to finalise its plans for the site, which are rumoured to include retail and residential development. 12 April 2003: The Herald repeats the story. 1 July 2003: The Edinburgh Evening News reports that the Edinburgh Film Festival has moved its opening night, following news of the cinema's proposed closure. February 2004: External inspection reveals the cinema to be vacant and boarded up at ground floor level. It is being marketed for lease. 21 February 2005: The Edinburgh Evening News reports that the Director of the Edinburgh International Film Festival has criticised proposals by Duddingston House Properties and Edinburgh University to demolish the building behind a retained façade to make way for a bar, restaurant and 240-room student complex. The Cockburn Association has also criticised the plans. June 2005: Local planners report that the current application remains under consideration. August 2006: Local planners report that a recent application for partial demoltion and development of student accommodation was withdrawn. November 2006: Edinburgh Evening News reports that a consortium led by Dale Gibson is looking to transform the cinema in to a £5million boutique cinema with artists studios and café bar. 31 May 2007: Edinburgh Evening Newsreports that Duddingston House Properties wants to demolish the interior, triggering protests from objectors. February 2008: An application has been submitted for the part demolition and conversion of the building to hotel, bar/restaurant, artists studios/galleries and community facilities. The application includes a conservation plan by architects Simpson & Brown. Ref: 08/00197/FUL and 08/00197/LBC. April 2008: The Scotsman reports a campaign has been mounted to urge councillors to reject plans to demolish the majority of the building for development behind a retained facade. The Cinema Theatre Association are reported to be lobbying Historic Scotland to upgrade the Listing from B to A. Historic Scotland are quoted as stating upgrade in Listing was been considered but was postponed as it does not normally consider buildings for listing whilst there is a live planning application. October 2008: The Scotsman reports local authority planners have recommended approval for the development plan for the former Odeon cinema. 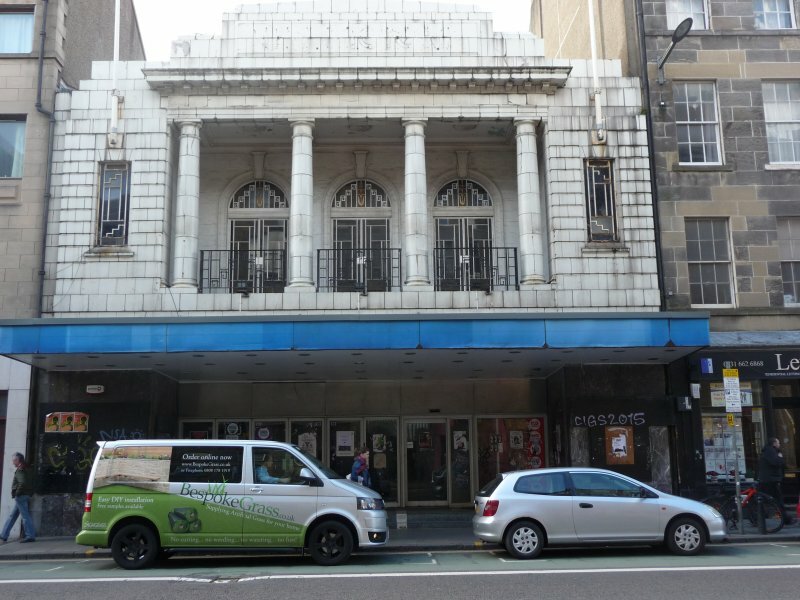 Historic Scotland are reported to have objected as they do not feel the developer has sufficiently justified the partial demolition of the "finest surviving cinema building in Edinburgh". Cinema historians and conservation groups are also reported to be campaigning against the scheme. April 2009: The Edinburgh Evening News reports on a petition being launched to prevent the partial demolition of the cinema. The article goes on to note 1350 signatures to have been gained to date, calling for Historic Scotland to refer the application to Scottish Ministers. The developers, Duddingston House Properties are reported to feel there is no feasible alternative for the economic repair of the building. Edinburgh Herald & Post repeats the story and updates the petition to 2700 signatories. May 2009: The List reports on the Drivers Jonas report and notes the possibility of a public enquiry being held into plans for the partial demolition of the cinema. The Edinburgh Evening Times repeats the story and updates the petition to 5000 signatories. June 2009: The BBC and The Scotsman report that Historic Scotland have called-in the application to be decided by an independent reporter to Scottish Ministers. October 2009: The re-use of historic buildings report by Edinburgh City Council notes the current applications (08/00197/FUL & LBC) have been called in for determination by Scottish Ministers. November 2009: The Edinburgh Evening News reports that vandals have broken into the building causing damage to a statue and plasterwork. 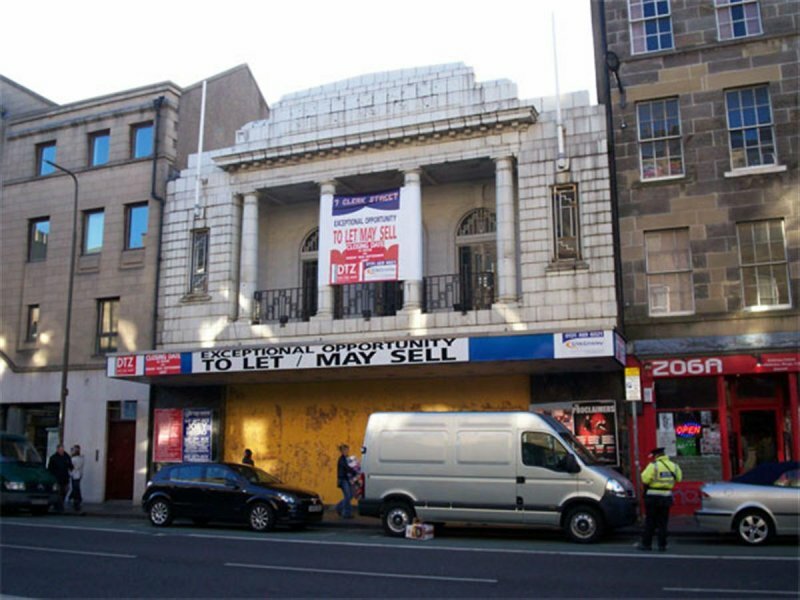 May 2010: Edinburgh Evening News reports a Scottish Government reporter has granted the former cinema a reprieve from partial demolition, advising that all viable alternatives have yet to be fully explored. The buildings owners, Duddingston House Properties has advised they will meet with the Council and Historic Scotland to discuss ways forward. August 2010: Edinburgh Evening News reports Elim Pentecostal Church, owners of 500 UK churches and a commercial cinema in Londons Notting Hill, has previously made offers of purchase to DHP, with a view to restoration as cinema, theatre and community venue. DHPs director is quoted as not having received a proper, legal offer from Elim, adding that the cinema would be marketed in September. October 2010: The Scotsman reports on an alliance of venue managers, art administrators and designers hoping to raise the necessary funds to convert the cinema into a centre for the arts, under the name The New Victoria. The article notes the property is now being marketed for sale, for a trial three month period, at £2.93 million by current owners Duddingston Properties. February 2011: BBC news website reports Duddingston House Properties have not received an offer reaching the £2.5million asking price. The article notes DHP is to reapply for planning consent. 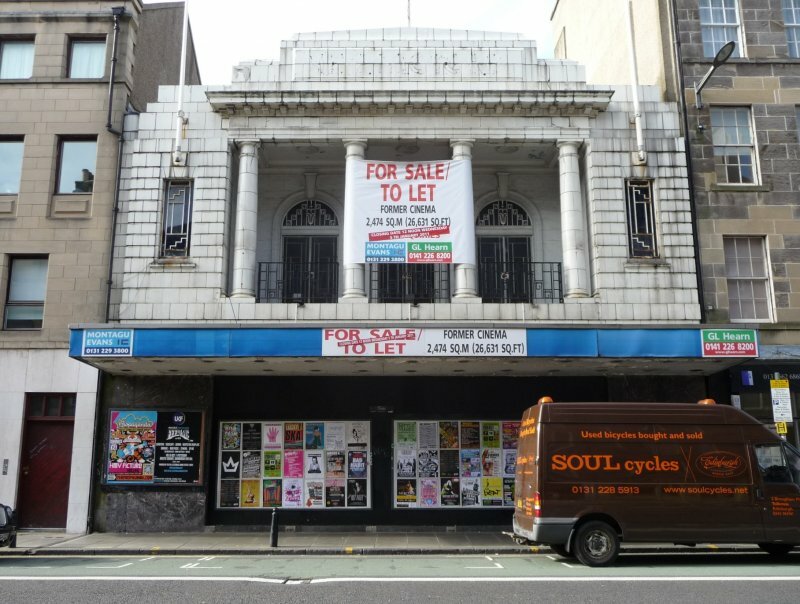 June 2011: Edinburgh Evening News reports that Edinburgh City Council has refused the application for partial demolition of the former Odeon Cinema. March 2012: Edinburgh Evening News reports Duddingston House Properties is considering a revised proposal for the building which will restore and reuse the front of the building as licensed premises with new student accomodation to the rear. The auditorium would be retained, but mothballed indefinately. 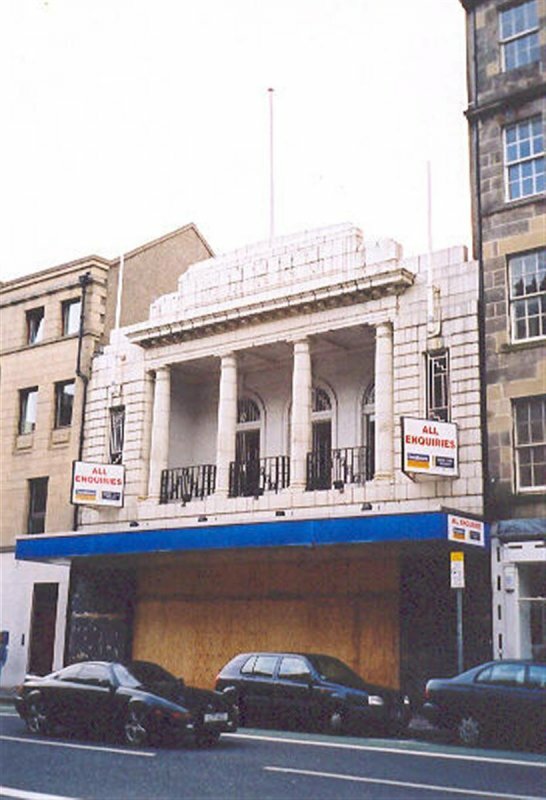 5 April 2012: Historic Scotland revise the listing of the former cinema and upgrade it from category B to category A. 4 October 2012: External inspection finds no significant change to the external fabric of the building. 19 December 2012: Edinburgh Evening News reports on new plans to re-open the property as a live show area on the upper floor, with the 2 ground floor cinema screens brought back into use. The plans also included a champagne bar, restaurant and coffee bar linked to the cinema. The article goes on to note the plans, brought forward by company An Instant World, are being backed by owners DHP. An application for certificate of lawfulness for live entertainment and as a cinema (Class 11) with ancillary bar, restaurant and coffee shop premises is currently being sought ref: 12/04368/CLP . 15 March 2013: A member of the public draws attention to a press report in the Edinburgh Evening News 1 Feb 2013.reports that company An Instant World has been granted a certificate of lawfulness by Edinburgh Council. The articles goes on to report that inspections of the building fabric had found worn carpets, cracking plaster and paint but no outward signs of water damage or dry rot. The initial proposal is to repair and re-open the building in phases. 16 August 2013: Refurbishment works to one section of the former cinema complex appear to be underway. The extent of the works is unclear at this time. 5 November 2013: Edinburgh Evening News reports on the partial re-opening of the former cinema - a foyer bar, Scruples champayne bar and the grand hall - as The Instant Arena. The article notes that re-instatement works remain ongoing and the 600-seat main auditorium remains shut. Moved to Restoration in Progress. 11 March 2014: No further works appear to be underway and the site is no longer open to the public. Moved to At Risk. 19 May 2015: External inspection finds the building remains disused and partially boarded up. Demolition of the rear fly tower is understood to have commenced in anticipation of the construction of new build student flats (12/04587/FUL & 12/04584/LBC) on the rear of the plot. 20 July 2016: The rear of the cinema site, facing onto Buccleuch Street, has now been redeveloped into student flats. The frontage of the cinema onto Clerk Street (entrance foyer and auditorium) remains intact but is disused. January 2017: A member of the public notes an article in the Edinburgh Evening News (1/8/2016) reporting on proposals by a new owner G1 Group to restore the bulding into film theatre, cafe and bar. 2 February 2017: Local planners advise restoration works are now underway at the site. Moved to Restoration in Progress. 16 January 2019: BARR is advised restoration works are to re-commence shortly - construction work had temporarily ceased whilst issues with a plot of adjacent land and a gas main were resolved. Earl and Sell (2000), p62; Eyles (1996); Gifford, McWilliam and Walker (1984), p249; Thomas (1984), pp2, 12-14, 16-17, 44.